Creating a wedding registry can feel more like a to-do list than a compilation of products that inspire and excite you, but it doesn't have to be. When you're planning a wedding, it can be easy to focus in on the details of your big day and not on carrying the romance from your wedding into the new life that starts after you're married. Creating a wedding registry can feel more like a to-do list than a compilation of products that inspire and excite you, but it doesn't have to be. 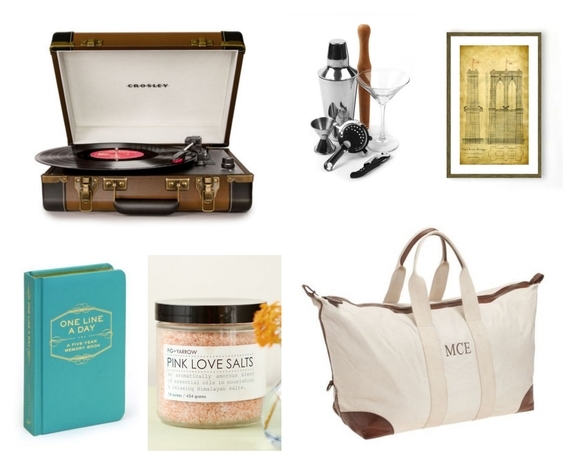 I shopped the gifts from the newly launched wedding registry platform, Blueprint Registry (It's the first wedding registry based on the blueprint of your home, which I think is genius) and compiled a list of my 10 favorite wedding registry gifts to keep romance alive in your home. Check out my picks and leave me a comment and let me know which ones you love! 1. Crosley Executive USB Portable Turntable: Studies have shown that listening to music can make us generally happier and less stressed! Retro style meets modern technology with the Crosley Executive turntable, which takes your favorite vinyl and converts them into digital files. 2. Day of Games Gold and Silver Bocce Ball Set: The couple that plays together stays together. This stylish gold and chrome finished bocce ball set will bring style and fun to any backyard party or to an at-home date night. 3. Union Canvas Weekender Bag: Traveling to a new city or taking a break from your normal routine is the perfect way to spice up your relationship. The Union Canvas weekender bag makes a stylish and ecologically friendly travel companion when packing light or carrying on board. 4. Framed Print - East River Bride II: Register for a print of a city or landmark that means something to you both. Maybe you got engaged in Washington, D.C., or got married in Austin. Regardless of the place, a print of a location that holds meaning to you both is sure to always bring a smile to your face when you see it hanging on the wall. 5. Martini Set from Blueprint Registry: It's 5 o'clock somewhere! Having a happy hour with your significant other is sure to make you, well... happy. Shake up your favorite cocktails with the American Metalcraft Cocktail shaker or make opening a bottle of wine a breeze with the Cork Pops Original Wine Bottle Opener. When you bring the bar to you, the best part is, you won't have to worry about who's driving home! 6. Tribeca Living 800 Thread Count Egyptian Cotton Sateen Sheet Set: Does this gift even need an explanation as to why I chose it? Not only does a good night sleep make everyone feel better, but these super soft sheets are sure to inspire any couple to want to hit the sack for other reasons than to just catch up on some Z's. Keeping romance alive in the bedroom is always easier with a comfy bed calling your name. 7. Chef's Choice Deluxe Waffle Cone Express Kit: After you've worked up an appetite in the bedroom, it's time for a sweet treat. This at home waffle kit makes for a fun date night idea and is something you can both do together. 8. One Line A Day Five-Year Memory Book: This classic memory keeper is the perfect way to track the ups and downs of life, day by day. The 365 daily entries appear five times on each page, so that you can revisit your previous thoughts and memories over the five years as you return to each page to record the current day's events. It's a great way to reminisce on good times together and to help you both appreciate all of life's little moments. 9. Fig + Yarrow Pink Love Salts: Whether you're soaking in the tub together or drawing a bath to de-stress after a long day, Mineral-rich Himalayan pink salts provide a warm, aromatic bath soak, made to detoxify the body and relieve sore muscles, while stimulating circulation with an amorous blend of essential oils. 10. Linnea's Lights Candle From Terrain: Set the mood with the sophisticated blend of patchouli, vanilla, and lime in this calming candle. Combining natural soy wax, lead-free cotton wicks, and pure scents, Linnea's Lights clean-burning candles are carefully hand-poured in small batches and sure to add a special touch to any dinner or quiet night at home. 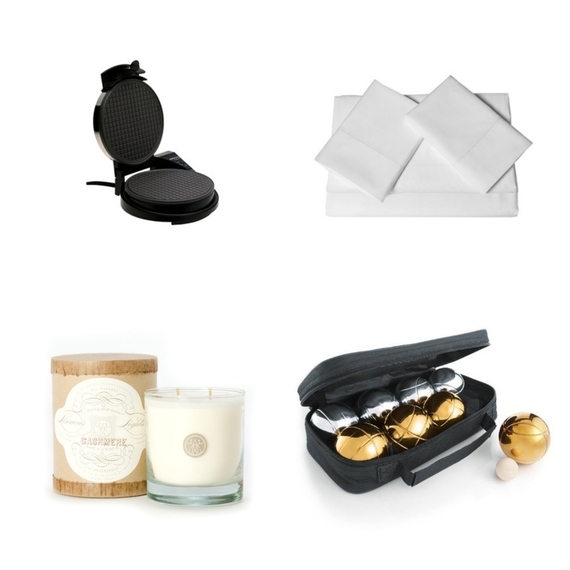 Check out these and other creative wedding registry gifts on Blueprint Registry. Happy shopping!